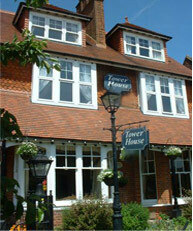 Tower House 1066 provides elegant guest accommodation in St Leonards on sea (within ¾ mile of Hastings). We provide a personalised service to make your stay a real home away from home, while giving you the privacy you need to unwind. 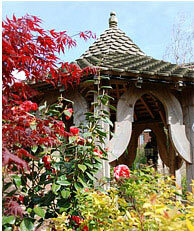 Bask in the evening sun on the garden terrace, or sit in our handmade gazebo in the shade. Relax with a book by the fire in the large comfy sofas of our guest lounge. Sip a drink in our licensed bar, or simply retreat to the comfortable, welcoming bedrooms of our St Leonards guest accommodation. Ground floor rooms with mobility access. Awake revived to a freshly prepared breakfast, packed full of hearty Sussex fare and our homegrown produce. Breakfast is served in the conservatory overlooking the garden, or in our elegant dining room. 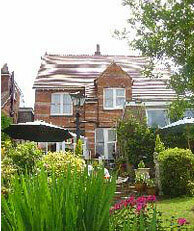 Our guest accommodation in St Leonards caters for most special dietary requirements (e.g. gluten free). We’ve also been awarded a Visit Britain 4 Star Silver award and do our utmost to be environmentally friendly. With free unrestricted on street parking, our guest accommodation in St Leonards (Hastings) is only an hour from London or Brighton, and ideally placed for leisure and business. Visit the historic Hastings Old Town, beautiful Alexandra Park, stopover for Ashford and Dover, or have a nostalgic Famous Five style day out at the British seaside. Ginger beer anyone? Why not book our St Leonards guest accommodation online? You can also contact us about our complimentary therapy package breaks, or holding your next event at Tower House 1066.